The culmination of the U.S. Coast Survey's work around San Francisco. A rare coastal chart of San Francisco by the U. S. Coast Survey, 1859. Oriented to the west, this map depicts the immediate city of San Francisco and surrounding areas as far as the Mission de Dolores and Rancho San Miguel. The chart was issued about ten years following the population explosion brought on by the 1849 gold Rush. Depicts the city extending only about eleven city blocks from the waterfront. Labels piers, wharfs, parks and roads as well as indicating important individual buildings such as the City Hall, the Post Office, hospitals, and churches. The Bay features detailed depth soundings. Text on public buildings, reservoirs, sailing notes, shoals, and tidal notations are included on the top left and lower right hand corners of the map. 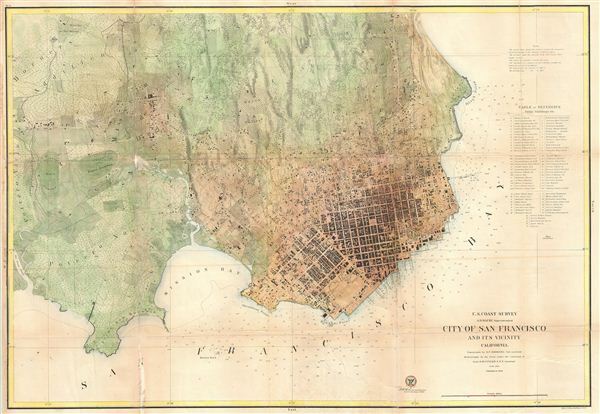 The work of the coast survey around the city of San Francisco was completed in 1852 and first known U.S. C. S. plan of the city and its immediate vicinity was published in the same year. Rumsey suggests that the actual city plan was taken from an earlier map produced Cook and Le Count, and Vogdes suggests that the interior topography is drawn from the eddy's official map of San Francisco. This first Coast Survey Chart of San Francisco was oriented to the north and covered a considerably small area than the map offered here. The above chart was issued in 1857 to replace the 1853 chart and account for the rapid urbanization of the San Francisco vicinity. Although much of the actual topography is based on the original 1853 map, there are a number of important updates and expansions, especially in the extreme eastern and southern quadrants. The notation of the Union Race Course, the Pioneer Race Course, the Road to San Jose, and the Rancho de San Miguel are but a few such additions. Furthermore, this map also features the addition of a 'Table of References' to the right of the main map. This numbered table identifies a number of important buildings throughout the city including churches, theaters, hotels, fire houses, hospitals and government buildings. The trigonometrical survey for this map was prepared by R. D. Cutts. The topography was accomplished by A. F. Rodgers and the hydrography by R. M Cuyler. engraved by Julius Bien. All work was produced under the supervision of A. D. Bache, one of the most influential superintendents in the history of the U.S. Coast Survey. Good. Backed on archival tissue for stability. Minor loss and toning on original fold lines - see image. Fill repair left margin. Vogdes p. 254. Rumsey 1030.000. Guthorn, P. J. United States Coastal Charts 1783 - 1861, p. 194.